These articles are based on a document on NASA's website by Silvano Colombano, a researcher at NASA's Ames Research Center in Mountain View, California. It really does argue that scientists should at least take seriously the notion that aliens may have visited planet Earth. But Colombano told Live Science that the coverage on Fox News and elsewhere misrepresented what he was trying to say when he wrote it. There's some nuance here. Colombano really does believe, as Fox News wrote, that aliens "may" have visited planet Earth. As in, it's theoretically possible that this has happened, not entirely impossible, and worth looking for evidence that it has. But that's not the same as expecting to actually find any such evidence, or believing that there's a good chance aliens are scuttling around under our noses — an impression you might get if you read Fox News's article. Though Colombano's name and email address appear right on top of the document, he said Fox News did not contact him before publishing their story. (Live Science has reached out to Fox News to confirm this, but has not yet heard back.) Fox described the document as a "new research paper" — a term usually used to describe formal articles intended for publication in research journals and making conclusions based on evidence and the scientific method. But that's not what this document is. "The context was a presentation delivered last spring at a meeting of the SETI (Search for Extraterrestrial Intelligence) Institute," he said. SETI is an organization devoted to the hunt for alien life, mostly by scanning radio signals from space for evidence of biological origin. "The meeting was to get feedback from scientists as to future directions for the Institute's research program," Colombano said. 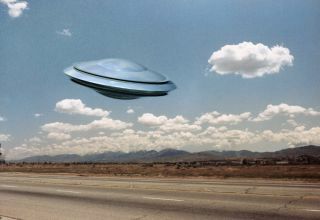 The document accompanied a talk he gave in which he suggested that perhaps the notion of aliens visiting Earth isn't quite as ridiculous as most scientists believe, and that SETI might devote some resources to systematically hunting through UFO reports and other data for evidence that this has happened — to hunt for a faint, unlikely signal in a lot of messy noise. In other words, it was a speculative piece of writing intended to persuade other scientists to spend their resources on a long-shot project — not an argument about whether or not aliens have actually visited Earth. Colombano's position is that it's possible, but not necessarily likely.